You have no idea how long I have been looking for this for...literally since the day replay came out, I even wrote to Evolv, Lostvape and DJLSB himself! I tried recreating the theme with replay myself, to no avail. So SUPER thank you! 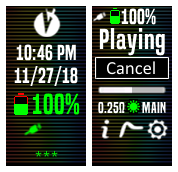 Would it be possible to do a version of this that doesnt have the colour toggle but does have an extra decimal place on the resistance reading? Single decimal place resistance is a bit rough. Wow, that was fast! Thank you so much! Should things like this also be going to the new Downloads section? I will load my other DNA device defaults there over the next few days. Sup Puffers, I accidentally loaded the wrong profile onto my volcano lavabox M (mini) DNA 75 18650 mod, then realised I never backed it up when I unboxed the device...whoops. Can anyone help me out by uploading the .ecig file for escribe? If not I will post back here if/when I find it so that anyone else with the same situation can find this.